Successfully Added Wrist Band Portable Battery to your Shopping Cart. Portable style wrist band rechargeable Li-ion battery that is worn like a wrist strap. This wearable rechargeable battery pack is designed for quickly and easily supplying extra power to all of your popular portable electronic devices. 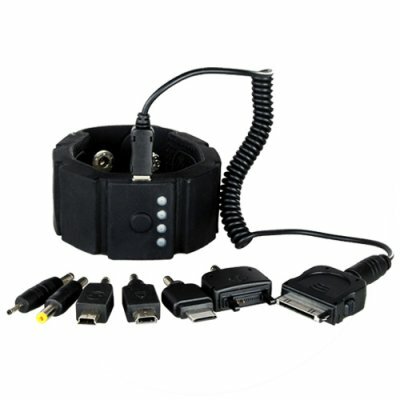 Provided with a stretch cord and 7 types of power connectors, it is easy to wear your new fashion accessory while powering your cellphone, MP3/MP4 player, portable game player, and similar handheld personal electronics. When used as a direct power source, provides up to 3 hours talk time or up to 8 hours MP3 use. Wrist band style rechargeable li-ion battery for powering portable electronics. Includes connection adapters for most popular brand cell phones and portable electronics.